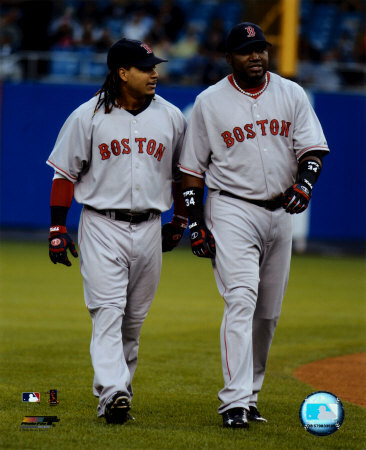 Two of the most integral parts of the Boston Red Sox 86 year drought-ending World Series Championship were included on a list of roughly 100 players that had tested positive for performance enhancing drugs in 2003. This according to lawyers with access to the list. Baseball first tested for steroids in 2003, but the list was supposed to remain anonymous. That first round of testing has since surfaced and included names like Barry Bonds, David Segui, Alex Rodriguez and Sammy Sosa. So can it be assumed that the Red Sox cheated their way to breaking the Curse? If so, then I think we would have to agree, as most do already, that Barry Bonds cheated his way to beating Hammerin’ Hank. With all of this coming to light, and seemingly something new coming out everyday, I think it is time to make the penalty stiffer. How would the Dodgers fair without Manny for the rest of their season? Maybe bump the first offense to 100 games or even the entire season. I think a player would think twice about injecting if they knew they would lose their entire season and seriously jeopardize their career. It is time for baseball to figure out a way to weed out the natural talent from the bums with needles. You are currently browsing the archives for the PEDs category.